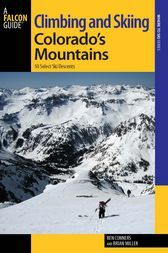 Climbing and Skiing Colorado’s Mountains is a select guidebook to 50 of the most classic, aesthetic, and iconic backcountry ski descents in the state of Colorado. The book provides accurate information to backcountry skiers and snowboarders, including overviews, maps, photos, and route descriptions for each of the selected 50 descents, while at the same time spurring the reader on to investigate peaks and areas outside of those featured in the book. Unlike other guidebooks, Climbing and Skiing Colorado's Mountains focus on peaks of all elevations located in all ranges throughout the state, including many 13ers and 14ers but also some smaller, more accessible peaks, representing a comprehensive mix of some of the best backcountry skiing Colorado has to offer. "Colorado has hundreds, if not thousands of ski mountaineering lines. But certain routes stand above the rest for their pure beauty, excitement, or history. A list of fifty works well. Wax your boards, pack your pack, and sharpen your pencil. With the help of Ben and Brian, you'll be making check marks in no time." Ben Conners was born and raised in Colorado. A graduate of CU Boulder, Ben has spent extensive time in the mountains in all seasons as a ski mountaineer, rock climber and conditioned peak bagger, with the spring ski season his favorite time of year. Brian Miller was born in Maryland and moved to Denver in 2006 to pursue his dream of living and playing in the Rockies. A graduate of Brown University in Rhode Island, he found that the nearby mountains in Vermont and New Hampshire weren’t enough to satisfy his insatiable love for the hills, so a move West was in order.